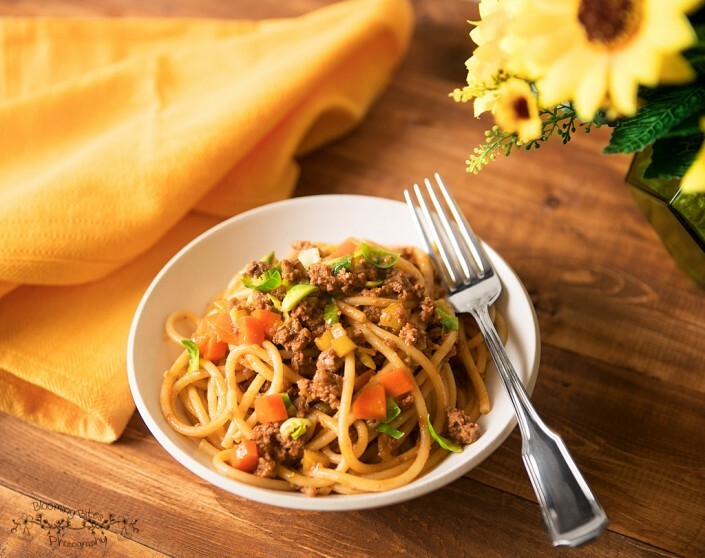 On the table tonight we will be enjoying yet another Blue Apron meal, and we are confident it is going to be as delicious as this Pasta Bolognese. We always know we love what we’re eating when we think to ourselves, “OMG this has to be blogged about!” which happens more than we’d like to admit, and that is exactly the case with this recipe. Now that we admitted to being food blog junkies, let’s change the subject and talk about how wonderfully easy this recipe was to prepare. In just six easy steps and 40min of your time, you can enjoy this clean yet hearty meal for yourself. Keep in mind with all these Blue Apron recipes we post, they are meant to serve 2 people only. Cooking for 4? Just double the recipe, but i’m pretty sure that’s implied. We added a touch of garlic because old habits die hard, but otherwise the combination of flavors in this recipe is perfection.. When we typically make a meat sauce, onion is our favorite ingredient, yet we found the substitution of shallots refreshing and different. This is definitely not something we would have cooked up on our own, which is yet another reason the service has been a breath of fresh air. Also, taking the guess work out of dinner has made cooking more enjoyable and less stressful. Another Blue Apron winner, and we hope you all enjoy. Happy Cooking! Prepare the ingredients: Wash and dry the fresh produce. Heat a large pot of salted water to boiling on high. Peel and mince the garlic and shallot. Peel and small dice the carrot. Small dice the celery. Cut off and discard the stem ends of the Brussels sprouts; halve lengthwise, then thinly slice crosswise. Cook the aromatics: In a large, high-sided pan (or pot), heat 1 teaspoon of olive oil on medium until hot. Add the garlic, shallot, carrot, and celery; season with salt and pepper. Cook, stirring occasionally, 2 to 4 minutes, or until softened and fragrant. Add the tomato paste: Add the tomato paste to the pan, season with salt and pepper. Cook, stirring frequently, 2 to 3 minutes, or until dark red and fragrant. Add the beef: Add the ground beef to the pan; season with salt and pepper. Cook, frequently breaking the meat apart with a spoon, 4 to 6 minutes, or until browned and cooked through. Remove from heat. Cook the pasta: While the beef cooks, add the pasta to the pot of boiling water. Cook 8 to 9 minutes, or until just shy of al dente (still slightly firm to the bite). 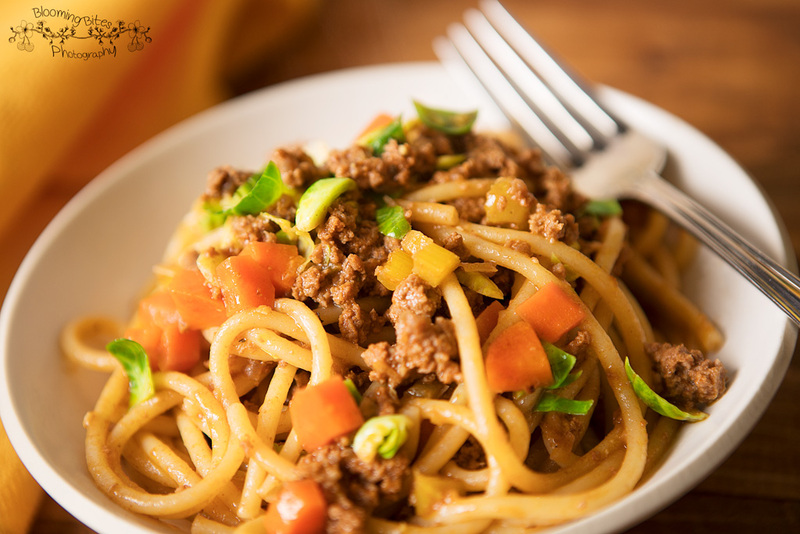 Reserving 1 cup of the pasta cooking water, drain thoroughly and transfer to the pan of cooked vegetables and beef. Finish the pasta & plate your dish: Add the Brussels sprouts and 3⁄4 of the reserved pasta cooking water to the pan. Cook on medium, stirring occasionally, 3 to 4 minutes, or until thoroughly coated. (If the sauce seems dry, gradually add the remaining pasta cooking water to achieve your desired consistency.) Remove from heat; season with salt and pepper to taste. Divide the finished pasta between 2 dishes. Garnish with the cheese. Enjoy!